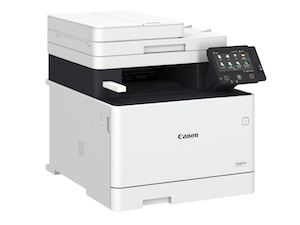 Canon, has announced the latest devices to join its popular range of i-SENSYS printers and MFPs. The i-SENSYS MF730 and i-SENSYS MF630 series and i-SENSYS LBP650 and i-SENSYS LBP610 series are compactly designed to support flexible working in home offices, as well as small and medium-sized enterprises (SMEs). Packed with intelligent features to help streamline document workflows, the new devices ensure maximum efficiency and productivity while reducing the total print cost, allowing companies to invest more time in core business activities through smarter working practices. The i-SENSYS devices use new engine technology to print at up to 27 pages per minute and selected models carry out single pass, double-sided scanning in seconds. To maximise efficiency and enable businesses to focus on their core operations, this speed is combined with an intuitive user experience delivered by the 5-inch colour touch screen available on the MFP models and the LBP654Cx, which enables easy navigation of key functions. This easy layout and simple interactivity significantly reduces operation time, empowering businesses to commit more resource to key tasks. The user interface also features improved graphics and help screens that aid workflow management and reduce maintenance. An easy-to-use Qwerty keyboard further eases the data input process. As the need for an agile workforce becomes increasingly important to businesses, the devices’ in-built technology adds flexibility to print and scan functions. The Application Library Function supports personalisation of advanced workflows with simple one-touch operability. Equipping users with the ability to store and run regular jobs in one touch, the feature also makes information sharing instantly easier, liberating time-poor users from inefficient processes. The i-SENSYS devices further enable digital working, leveraging a direct wireless connection to allow easy peer-to-peer printing without compromising on network security. Compatibility with the Canon mobile app, Canon’s PRINT Business, AirPrint, Mopria and Google Cloud Printing platforms means that teams can perform printing and scanning functions on-the-go without needing to switch to a desktop or laptop. The enhanced functionality of the MF Scan Utility allows businesses to create searchable PDF documents, attach scanned files to an e-mail and send directly to cloud services. The new devices are designed to produce consistently stunning results and feature a variety of tools to improve productivity. Helping to support productivity goals, the range minimises the time and expense spent on maintenance so that investment can be made back into the business. Capable of delivering professional-quality prints using improved technology, the devices also feature new all-in-one cartridges with up to 85 per cent more toner capacity than previous models. This makes managing and maintaining the number of consumables easier, as well as ensuring consistent reliability and quality to help businesses differentiate themselves from the competition. The i-SENSYS MF730, i-SENSYS MF630, i-SENSYS LBP650 and i-SENSYS LBP610 series will be available through Canon sales offices and selected distributors across Europe from June.